Microsoft has finally given the unique Windows 8 Store to install Windows 8 apps from. And yeah…no one would ever want to disable this amazing Windows 8 Store from the Microsoft’s new OS, at least I wont ever do this. However, sometimes we come across such circumstances where we are forced to do this, most probably when you are testing Windows 8 in a business environment. Well…in any case, I would never disable my favorite Windows 8 feature and would never recommend anyone to execute such a blunder. 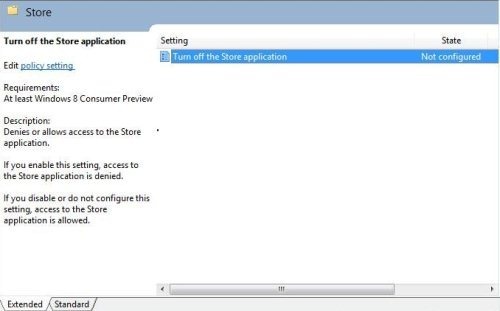 Now, if the reasons are unavoidable, then check out the steps on how to disable Windows 8 Store. Under the “Store?Settings” column, there is an option to turn off the Store, available at the right-side. Just Double-Click on the same. To take this action into effect, you are required to enforce the updated policy. Press Windows Key+R Key to open the run box. In the run box, type “gpupdate /force”, and click on “OK”. Do not miss out our post on Best Windows 8 Post selected from the last week’s ones. Yup…you are done. You have successfully disabled Windows 8 App Store. Go ahead and try it out, only if you have no other option except disabling it.